Thanksgiving is coming soon! 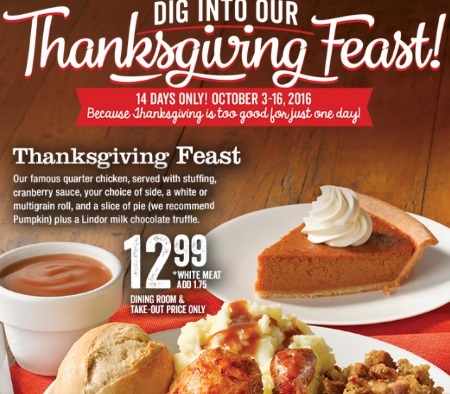 Swiss Chalet has a Thanksgiving Feast available for 14 days! The meal includes their famous quarter chicken, served with stuffing, cranberry sauce, your choice of side, a white or multi-grain roll and a slice of pie (can be pumpkin! ), plus a Lindor milk chocolate truffle for $12.99. Offer is available October 3-16, 2016 only. Order online or at the restaurant. Click here to browse Swiss Chalet.